Tonight I took out the cookbook my family made in honor of my grandmother. It has her original hand-written recipe cards photocopied onto sheets with loosely related photos next to each, and typed versions of all the recipes. The project was done while she was still with us, and my mom helped her come up with captions and chose the photos — she said gramma "didn't like to dwell in the past." So the captions are simple and strangely straightforward. I hadn't looked at it in a while. What caught my eye tonight was her recipe for "Happy Day Cake", and its accompanying photo, captioned "We miss those times." I think the caption refers to the accompanying photo of her and her husband on a vacation (honeymoon?) in Canada. 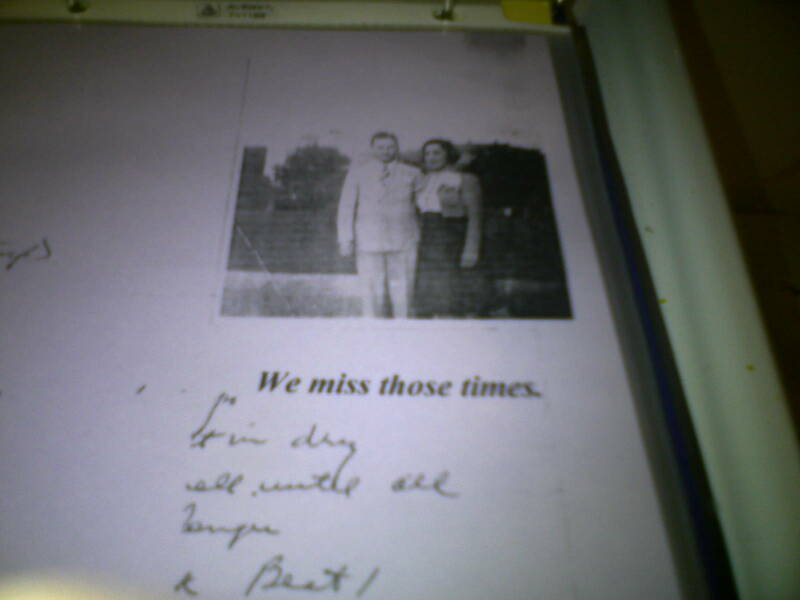 Seeing the photos and especially the handwriting brought back a flood of gramma memories. Lots of food-connected memories. She had legendary chocolate chip cookies. When she died, the extended family fought over the last remaining batches, and everyone went to wartime-style rationing as no one wanted to exhaust their supply too quick. So here's the Happy Day Cake recipe. I'm sure it's nothing unique; some of her recipes have been known to have been traceable back to package labels. And sometimes there's an unclear passage here or there. But they work, you can be sure they're time-tested, and they remind me of her. Measure flour. Add sugar, baking powder and salt. Soften shortening in mixmaster????[sic]. Sift in dry ingredients. Add 3/4 cup milk and mix well until all flour is dampened. Beat 2 minutes longer. Add eggs, vanilla, and remaining milk. Beat 1 minute more. Bake in 375 oven 20-25 minutes for a 9" layer. Worth the wait… I love old recipes and cookbooks, and the memories they bring up. Dave, I sort of feel weird even commenting on this sort of personal thing, but I think I can shed some light on the recipe itself (if you haven't figured this stuff out already):1) You're right about "T," of course. My older relatives seem to use "T" for teaspoon and "Tb" for tablespoon. And the amounts would be crazy otherwise.2) "Mixmaster" almost certainly refers to a standing mixer, like the KitchenAid a lot of grandmas (and me) have.Anyway, very nice post.